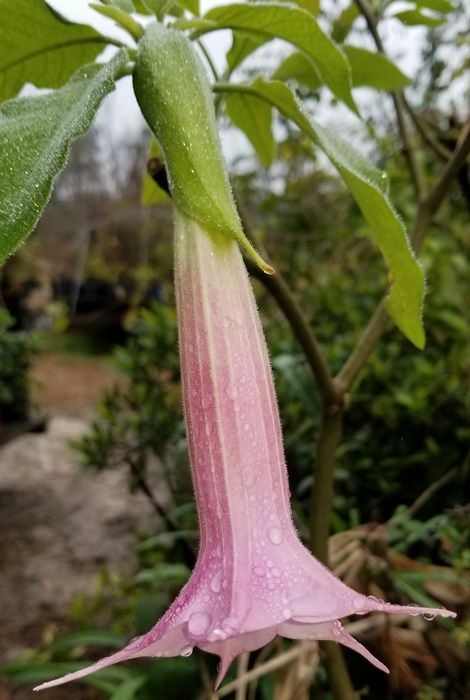 Soft pastel pink with hints of purple 6-8" long trumpets are produced seemingly throughout the year on this smaller growing hybrid Angel's Trumpet with trumpets angled sideways versus the typical straight downward hanging trumpets of most Brugmansia cultivars. Blushing Bride Brugmansia is a compact and smaller growing plant with probably the longest flowering season of any that we currently grow. 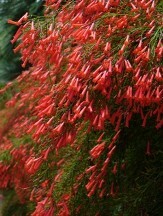 The smaller habit lends it to use as a magnificent container specimen. Due to its Brugmansia sanguinea parentage we are not yet certain of its cold hardiness in the ground but some suggest zone 8. 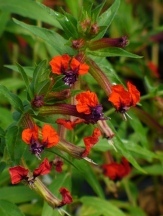 Provide a moderately fertile, well-drained average moist soil and midday shade for optimum vigor and flowering. Blushing Ballerina is sweetly night fragrant. 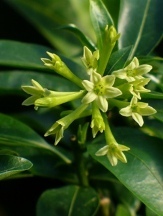 Flowering Period: Year round under warm tropical conditions. When to Plant: Repot/uppot spring through summer if overwintered indoors, plant out spring-midsummer. Dormant Shipping: Greenhouse grown, shipped year round if temperatures are acceptable.